That's a word I've thought a lot about lately. What does is mean? How do you get it? Where do creative ideas come from? I've spent the last few years more dedicated to creating than ever before and here is what I've learned from my experience. Ok, so just to be honest here, I usually don't come up with an idea totally and completely on my own. I'm almost always inspired by something else I have seen. It can be another artist's work, nature, or even clothing designs. I frequently walk out of Target with some painting ideas in mind. I just have a different idea of how I'd want it to look or how I would make it differently. So in that way, it becomes my own. I get out often to take photos of nature and keep a notebook or sketchbook handy at all times to make note of my ideas. If I don't write them down, they inevitable get lost in the jumble of my brain. My creative process varies from project to project. Sometimes I have to do a bit of experimenting, sketching, and planning to before I start the real thing. Sometimes I have to work at using a new medium- learn how to actually use it to gain the necessary skills. Other times I can go with the flow and start something cold turkey. That takes practice, practice, and ya, more practice! It's so rewarding for me to see a finished project that meets my expectations. The work is worth it! 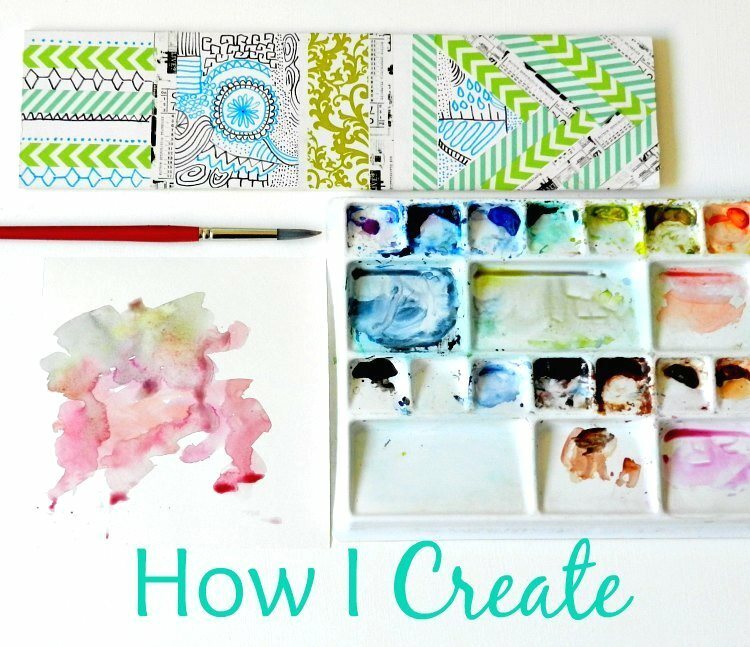 So, I'll walk you through the creative process that led to one of my favorite watercolor projects, my Watercolor Portraits. I got the idea for making these from another watercolor portrait I had seen somewhere online. It had the same posterized effect and looked so cool, but I had no idea how I could actually make one. Drawing the portrait like that by hand would take phenomenal effort and talent and I wanted to find an easier way to make it so that everyone could make one too, not just the super skilled artists. So I let the idea simmer a few months. It was always in the back of my mind. I was problem solving. Finally I remembered a pencil transferring technique I had learned in school and it donned on me that that was the answer. So then I entered the experimental phase. I tried posterizing all kinds of photos to see what worked best. Then I actually tried it would with watercolors on watercolor paper. Luckily this one was a success! So I made more! Even with ideas flowing, there are still times when my ideas don't materialize the way I envisioned them. But you never know unless you try right? One of the biggest resistors to creativity is fear. Fear of failure. Fear of not producing exactly what you had in mind. In my case, I worry about wasting materials- I'm cheap like that. You have to think on the positive side to be creative. Even if you end up with a failed project, or semi-failed project, there is still something to be learned and gained from it. Sometimes I discover that the idea was a bad one to begin with, sometimes I just have to figure out a new way to do it. And then once in a while, you get those glorious happy accidents- where you didn't plan something to happen, but it turned out better than you what you had in mind. When I find myself having failure after failure, it's usually a sign that I'm just frazzled with life and need a break. I need to get outside, take a vacation, play with my son, talk with friends. I come back later feeling energized and like my mind is alive again. I feel more inclined to create when I am balanced. So those are my thoughts on creativity! I hope that gave you a little insight into my world! I completely agree with allowing failure and getting outside somewhere when you're stuck. I loved seeing more of your process, thanks for sharing! I subscribe to very few blogs, and comment very rarely (really more like never). There's not much that can make me want to add even more clutter to my inbox. But I stumbled on your blog a couple of months ago and subscribed immediately. And this post is one of the reasons why. I've been on a desperate quest to reclaim my lost creativity, dormant for the past 4+ years, buried among kid-wrangling and household-running duties. Your talent and fearlessness have been so inspiring to me. So I just wanted to say thank you. I'm glad you found me Melanie! You are so nice. I understand how hard it is to create while raising kids, but I think it's worth it to invest a little time in something that you love- besides the kids of course. best of luck to you! Lovely post, thank you for sharing your creative process. I am a self taught amateur so my creative process often happens on the bus ride to work, sketching new patterns in my tiny notebook , compensating for all the bumps on the road. Thank you. That's awesome that you make time for sketching on your bus ride- what a good use of time! haha, I'm glad I'm not the only one who worries about wasting supplies. So much so, that I realised last year that I'd just been hoarding supplies 'until a rainy day or great project came along'. The thing is, you have it, it needs to be used. Since approaching it in that way, I've learned so much about different mediums and the way that I work, create and design. It's been inspiring. I even broke out the watercolours again! 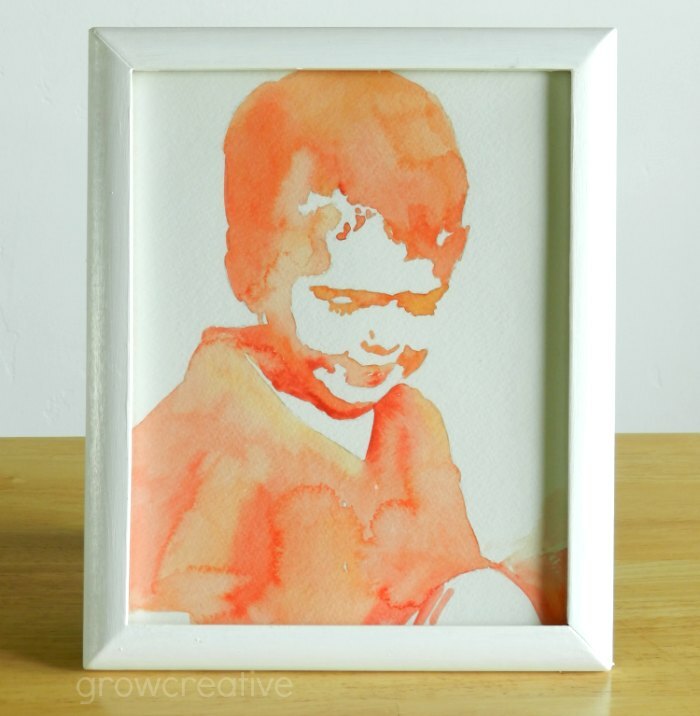 I'm pretty new to your blog, so perhaps it already exists, but I'd love to see a tutorial on the watercolour silhouette. Thanks for your comments Hannah. It's nice to have people who can relate! I'm glad you found my blog. You've left so many nice comments!